Since reading Meant to be Mine, I couldn’t wait to read Jake’s story in A Love Like Ours. If you’d like to read about Ty and Celia’s story in Meant to be Mine, you can read my review here. How did I miss Undeniably Yours, book #1 in the Porter Family series? Will have to remedy that! A Love Like Ours is one of those books that leaves you thinking about it long after you’re finished reading. The cover is cute, but it doesn’t give you a real inkling to the depth of this story. Jake struggles with PTSD. He lost his faith in Iraq along with his buddies, and horrific nightmares and survivor’s guilt chains him to a solitary lifestyle. Lyndie’s determined to help her childhood best friend heal, but along the way, she starts to view him differently…not so much as her childhood friend anymore. There were so many aspects of this book to savor and chew on. The strong faith thread with a “God is good” mantra even through hardships. Lyndie’s perseverance and determination to save Mr. Tall Dark and Brooding when most women would’ve given up. Her creative spirit, not only illustrating and writing whimsical fairy stories, but also building and decorating a “hero” house with her neighbor’s son. Cheering for Silver Leaf to win his race because their healing was so entwined. The powerful theme of hope and restoration woven throughout. What’s not to love about A Love Like Ours? 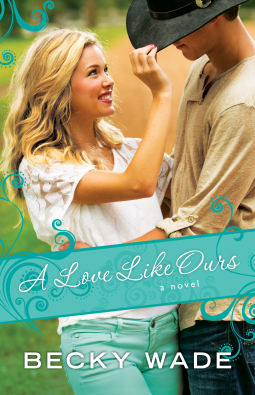 Disclaimer: Sending a big thank you to Bethany House Publishers and NetGalley for allowing me the privilege of reviewing A Love Like Ours and for the free copy I received in exchange for my fair and unbiased review. This opinion is my own, and I received no compensation. Hey Floryie! Yes, that'd be wise, but each book reads very well as a standalone. Waving back!! Thanks for popping in.